My name is Crash and I am one lucky boy! I was one day away from being put to sleep when some special people at the animal shelter made some phone calls to find me a new home. I was accepted into a program called Paws Giving Independence. 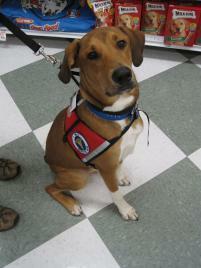 They train shelter dogs like me to become service dogs to help those with a disability. One day soon I may be helping someone in a wheelchair. I will get to go everywhere with them, even school and work! I have been in my new home for about 2 months now. I love them so much! I recently passed my public access test and now I get to train in the community. Schnucks is my favorite store! I also went shopping at the mall this weekend. I am learning to pick up objects from the ground, turn on/ off the lights and open the doors. What can I say I am one lucky dog? I now have a bright future in front of me. Thanks Paws Giving Independence and my friends at the animal shelter for saving my life, now I will be able to change someone else life!